Traditional head and carved wooded nose Beautiful Horse.. Suitable for Age 1 Year up as no small parts are used! 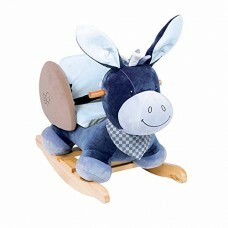 ..
A gorgeous and fun alex the donkey rocker from nattou's alex & bibou collection ..
A fantastic vehicle 3 in 1 in horse shape: Swing, Slide and electronic activity centre with..
95 - Large - 24-36 Months Soft And Comfortable Baby Leg..
2 in 1 - A rocker that easily converts into a ride on as your child grows .. Style Name:Carousel Rocking Horse ..
2 In 1 Rocking and Riding Pony Great Fun ..
Gorgeous, carefully crafted Floral Rocking Horse with plush body. ..
Includes a plush pal who lives in the horses pocket Bea..
Little ones are safe and secure thanks to the backrest .. Deer Animal Rocker Comfy Hand Grips ..
Dimensions: 65 x 36 x 48 cm Made of short, durable mate.. Pack contains 2 cake flags. Flag size: 5 x 10 inches. Pack size: 7 x 10 inches .. Size:7.5cm*8.5cm Packing: 1 * party cap .. Pack of 20 Mike the Knight Invitations with Envelopes. ..